These fun design warn other drivers to avoid following the birding or twitching driver. You don't want anything getting in the way of your big year, do you? 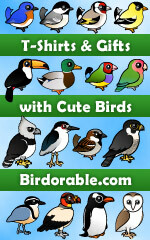 A perfect gift idea for the birder!